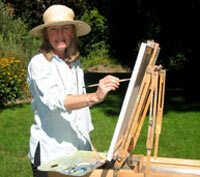 I am a landscape painter who has lived and worked on the East End for over 25 years. My oil paintings, watercolors, and pastels are painted on location and include views of farmland, forest, bay, mountain, desert and ocean vistas. My most recent work includes abstract studio paintings with a plant or garden theme. After graduating from Skidmore College, I received a Master of Fine Arts Degree in painting from the University of Pennsylvania in Philadelphia, PA, where I studied with painters such as Neil Welliver, Paul Georges, Alex Katz and Yvonne Jacquette. My work is in many private and commercial collections such as Texas Commerce Banc Shares, Southampton Hospital, Brown Harris Stevens. Teaching Experience includes: The Art Barge, East Hampton, NY; Southampton College, Southampton, NY; and Drexel University, Philadelphia, PA.
For five years I exhibited with a group of a dozen painters and photographers on the Eastern end of Long Island called Plein Air Peconic. Proceeds from our sales went to help a local conservation group called the Peconic Land Trust.